I Love Arnside & Silverdale: Have you ever been confused by what may sound like a Warbler but is'nt? Have you ever been confused by what may sound like a Warbler but is'nt? 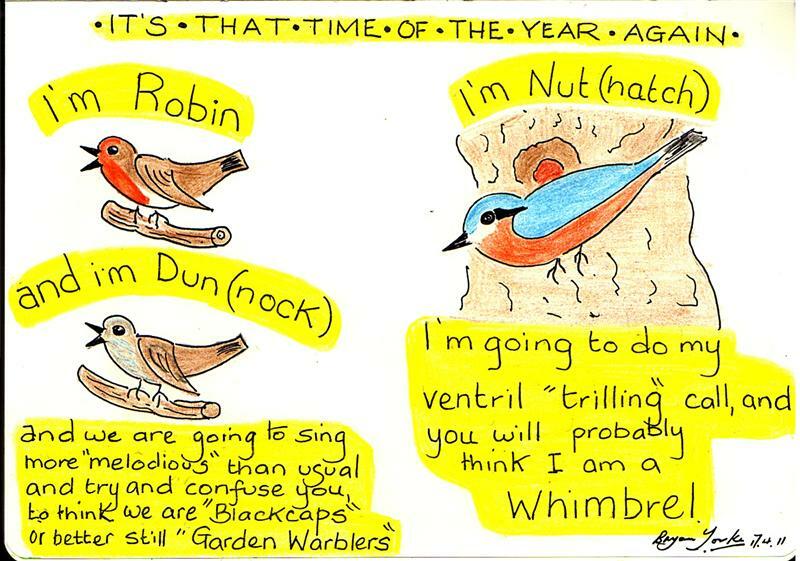 Well just in case you have your not on your own, because at this time of the year Robins and Dunnocks take on a totally different song to what they preach at other times of the year. I often think they are rebellious to the arrival of the Blackcaps and Garden Warblers, and subsequently have decided that they want some of the action!! Also at this time of the year the Nuthatch takes on a very ventril "trilling" call, and very strong for just a medium sized bird. From a distance it may even sound like you've got a Whimbrel close at hand!! Soon on the Hilderstone Road and before the farm I turned off right on to the bridleway which eventually leads on to the A6. Here just behind the farm is some woodlands, which also contain some mature conifers. From here I had another singing Willow Warbler and also a singing Blackcap. A little further on and I disturbed two male Mallard which were down in the dykes. Also a Lapwing was flying about my head, obviously very agitated. I could see a sitting bird over in the field and also what I thought could well have been small chicks moving about! At this point also had another Willow Warbler in song. Also along here there was Bluebells, Stitchwort, Self Heal and White Dead Nettle. And a nice finish before I arrived at the A6 was a beautifully singing Skylark. While walking in the verges of the A6 to reach Tarn Lane, I had another singing Willow Warbler. Then on reaching Cinderbarrow and Tarn Lane, I turned down eventually making my way back down to the village of Burton In Kendal. Just at the start of Tarn Lane I had another Meadow Pipit flying overhead on vismig, making two birds I had over the past couple of hours. 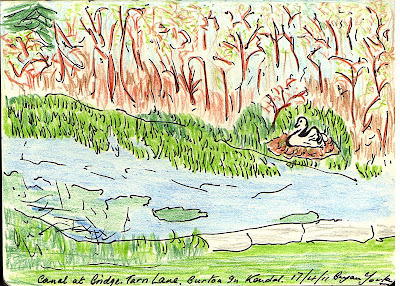 At the start of Tarn Lane I had Bugle, Dogs Violet, Daisy, Dandelion, Wood Forget Me Not, a Orange Tip Butterfly. and some Stitchworts. Also had the usual singing Chiffchaff at Cinderbarrow. On reaching the nearby railway bridge, a new Blackcap was singing his head off. A little further on and there was yet another Chiffchaff singing on the Canal, along with another 3 Willow Warblers in the close vicinity of the Canal. The sitting Mute Swan on the Canal seemed happy enough, and I decided to do some sketching, when out of the corner of my eye, I saw some movement and got superb views of a exceptionally large Stoat bounding about on this side of the Canal. Watched for a minute or so before he decided to go obscure within the nearby undergrowth. A further Blackcap was calling from further along the canal on the Tewitfield side. 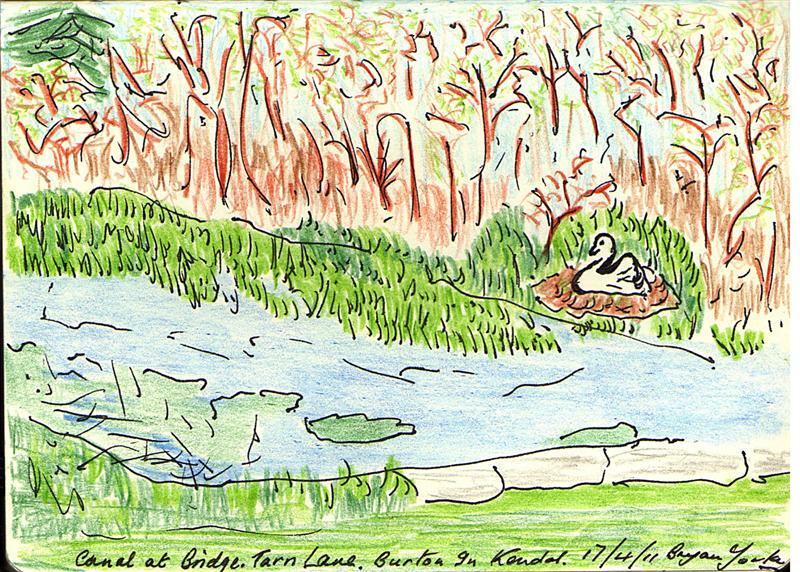 Further along Tarn Lane, I had yet another pair of Swallows heading North.